Who Needs Dental Implant Treatment? 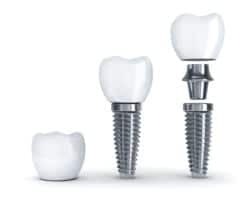 If you are missing one or more teeth, dental implants are a great way to restore your smile. Dental implants can be used to replace a single tooth, an arch of teeth, or a full mouth of teeth. They are designed to replace the natural tooth root as well as the visible portion of the tooth. Depending on the location and number of missing teeth, implants may be implemented to secure a dental bridge, dental crown, or denture. Dr. Joseph Cavallo is an experienced implant dentist in Woodbridge, VA. Committed to dental excellence, Dr. Cavallo performs all aspects of the dental implant procedure in-house. Overseeing all aspects of the implant process allows our team to make any adjustments to your care as needed. To learn more about tooth replacement in Woodbridge, VA, visit the office of Dr. Cavallo. He will guide you through the implant process and determine if they are right for you. Dental implants remain one of the most successful tooth replacement options available to patients today. Dentists often recommend implants because they provide the complete solution for missing teeth, as they replace the entire tooth root and the visible portion of the tooth. To meet your dental health and aesthetic goals, we design implants with your specific needs in mind. After a thorough examination, we will recommend the appropriate number of implants needed to restore your smile. For patients missing one tooth: If you are missing one tooth, the most common tooth replacement is an implant secured dental crown; this offers a natural looking, long-lasting solution to help restore your smile. For patients missing several teeth: An implant secured dental bridge is the ideal solution for patients missing several teeth. A bridge secured by implants can help bridge the gap between missing teeth. For patients missing a full arch of teeth: Implant secured dentures are a durable solution for patients missing one or both arches of teeth. Traditional dentures often run the risk of slipping, contributing poor nutrition, and difficulty chewing. Dentures secured by dentures virtually eliminate the common concerns patients have regarding dentures. Dental implants offer several benefits for patients missing one or several teeth. Dental implants are designed to last. With proper care and maintenance, dental implants can last many years. Implants help stimulate bone regeneration. When the teeth are lost, it can lead to bone density loss in the jaw, which can contribute to facial sagging, volume loss in the face and difficulty chewing and speaking. All implants offer a natural looking solution for patients who are missing teeth. If you suffer from a lack of confidence due to missing teeth, implants can help restore your confidence. They allow you to eat, speak, and laugh without worry. Implants are designed to look, feel, and function like your natural teeth. If you are seeking full-service dental implants in Woodbridge, visit the office of Dr. Cavallo. As a skilled implant dentist, Dr. Cavallo has in-depth knowledge and understanding of tooth replacement. To schedule an appointment, call (703) 493-1203 or request an appointment online.